“Based on the company’s cutting-edge behavioral science and patent-pending data analytics, Opower found that, on average, Yahoo Mail users consume 939 kilowatt-hours (kWh) more than Gmail users, or about 11% more electricity per year – a sizeable, statistically significant difference in usage,” they say. I don’t know why that happens, but Opower works with more than 70 electric utilities and the data they gathered reflect about 40 million U.S. homes. They simply made a connection between the users’ e-mail addresses and their electricity consumption trends. 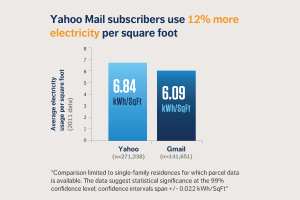 Intuitively finding an explanation to Opower’s finding, probably Yahoo Mail users have their e-mail accounts since 1998 or so, when they were younger, and didn’t make the effort to switch to Gmail, whose interface and concept totally differs from Yahoo’s. I think things are going to level by themselves in 5 years. That’s my explanation of the phenomenon. You may think different. Let’s hear.